Did you know that today, August 19, is National Potato Day? In Diamonds are Forever, James Bond’s hunt for vengeance after the events of On Her Majesty’s Secret Service leads him to an undisclosed location in search of his enemy, Ernst Stavro Blofeld, who has taken to cloning himself in order to form a group of decoy doubles to distract 007. Part of the pre-operation procedure consists of a volunteer decoy resting in an 80°F mud bath (while armed with a revolver, for some reason), and that’s where National Potato Day comes in. Bert Luxford, an uncredited assistant in the film’s special effects department, recalled that the “mud” was created with a mix of mashed potato powder and cocoa. Much to the dismay of the cast and crew, the mashed potatoes began to “cook” after 24 hours under the hot studio lights, creating an unbearably awful smell. You tell us, Sir Sean. Was it worth a million bucks to come back and stick your hand into a vat of rancid mashed potatoes? Today also happens to be the birthday of Connery’s Diamonds are Forever co-star Jill St. John, born August 19, 1940. In other Sean Connery news, less than week remains until the legendary Scottish actor’s 87th birthday…so prepare to see a little more of Sir Sean on BAMF Style in the coming days! Following a horribly sexist opening sequence that finds James Bond wearing a considerably dated beige-patterned terrycloth shirt while throttling a woman with her own bikini top, the setting shifts to Blofeld’s South American hideout where 007 is disguised in doctor garb over that most timeless of country garments: a tweed jacket. Bond’s brown-and-black herringbone tweed sports jacket incorporates some design elements from the Norfolk jacket, a classic piece of English sportswear. The unique lapel is shaped like a traditional notch lapel but with a dog-eared self-tab extending from the top portion of the collar to fill the gap, reducing the notch itself to a short slanted vent. The mixed brown and black fabric gives the jacket a dark muted brown effect that both flatters Connery and coordinates nicely to his black shirt and trousers. The lapels roll above the top of the three brown leather buttons on the single-breasted front with two smaller leather buttons on the end of each cuff. The wide shoulders have roped sleeveheads. There is no breast pocket but there are two large bellows-style patch pockets on the hips with a straight flap to close. Connery set the gold standard for Bond in tweed with the first appearance of his brown barleycorn hacking jacket in Goldfinger, and he goes on to wear not one but two tweed jackets for his return in Diamonds are Forever. Both this tweed jacket and the more mustard-toned check jacket he later wears in Las Vegas are detailed with the half-belted back, bellows pockets, and leather buttons consistent with Norfolk and half-Norfolk jacket elements. (Neither jacket has the “action back” bi-swing pleats found on many Norfolk jackets, but the lack of said pleats doesn’t disqualify the terminology.) The back of the jacket is split with double vents that rise to the half-belted waist. Dr. Bond administers to his patient. It ain’t a PPK, but it’ll do in a pinch. And speaking of guns… Bond wears his usual tan leather shoulder holster strapped under his left arm with a wide blue nylon strap. Less usual, however, is the fact that Bond seems to have forewent wearing an actual firearm in his holster in favor of a mousetrap-like device used to snare the hand of the hapless henchman that Blofeld sends to retrieve Bond’s pistol. Q branch comes through with another winner. Bond wears black flat front trousers with slightly flared plain-hemmed bottoms over his black leather ankle boots. We don’t see the waist line of his trousers due to the jacket, but the fact that we know Bond is wearing his holster coupled with his usual practice of securing his holster to the buttons of his side adjusters leads to the conclusion that these black trousers are fixed with the same “Daks top” three-button side adjuster tabs as on most of Connery’s tailored trousers since Dr. No. 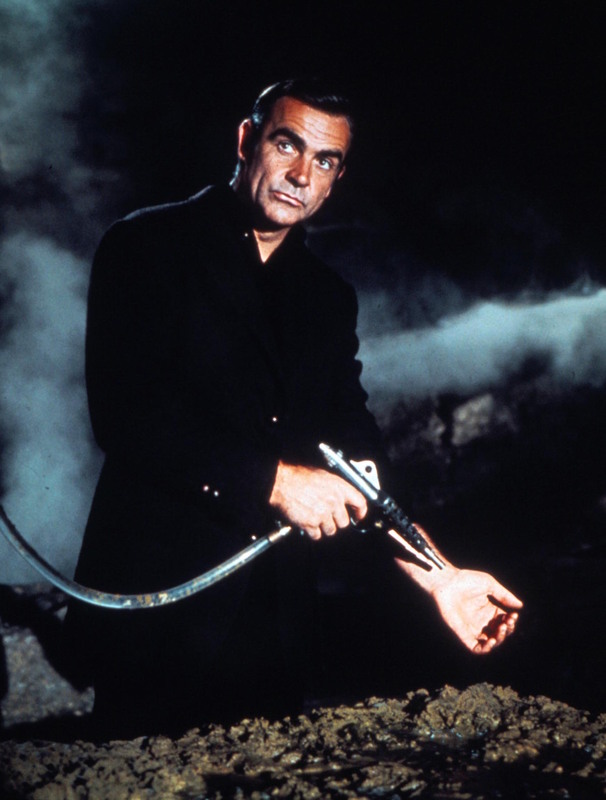 The color treatment in this publicity photo gives Bond the appearance of wearing all black clothing, as Sean Connery’s Bond had previously done for covert assignments in Goldfinger and Thunderball. Sean Connery channels 007’s previous “sneaking around” attire from Goldfinger and Thunderball of an all-black polo and trousers ensemble, though he layers it here with a dark tweed half-Norfolk jacket to create a more versatile and fashionable outfit. If you’re interested in an interesting behind-the-scenes account from a man with several Bond credits to his name, check out Bert Luxford’s memoirs, Albert J. Luxford, the Gimmick Man: Memoir of a Special Effects Maestro, where he recounts the “mashed potato” incident on set as well as many other tales from the British film industry’s special effects history. …and, of course, buy the movie . It’s worth watching just to see Connery pull off this gesture. You can also read more about this specific outfit at The Suits of James Bond. This jacket is a full button three style, not a 3-roll-2. On a 3-roll-2, the top button is obscured by the lapel and is unable to fasten. The top button on this jacket is in full view and is able to button, so it’s not even a “3-roll-2.5”. As this jacket was designed with more than a nod to English country sports, a rolled lapel would have been inappropriate. Most English tailors are not into designing their lapels to roll over the top button. The drape tailors did a gentle roll, but even the top button on their jackets were usually able to fasten if you really wanted to fasten it. But the drape tailors aren’t so relevant here because they were much removed from the sporting tradition of Connery’s jacket.